It is not uncommon that the term strategic plan and business plan get confused in the business world. Before beginning your strategy implementation, take a look at the difference between the two terms to ensure you are on the path to success. While a strategic plan is a type of business plan, there are several important distinctions between the two types that are worth noting. A strategic plan is primarily used for implementing and managing the strategic direction of an existing organization. A business plan is used to initially start a business, obtain funding, or direct operations. The two plans cover different time frames as well. A strategic plan generally covers a period of 3 to 5+ years, whereas a business plan is normally no more than one year. A strategic plan is for established businesses, organizations and business owners that are serious about growing their organization. Whereas a business plan could be for new businesses and entrepreneurs who are start-ups. A strategic plan is used to provide focus, direction and action in order to move the organization from where they are now to where they want to go. Whereas a business plan is used to provide a structure for ideas in order to initially define the business. A strategic plan is critical to prioritizing resources (time, money and people) to grow the revenue and increase the return on investment. Whereas a business plan is critical if the business is seeking funding. A strategic plan focuses on building a sustainable competitive advantage and is futuristic in nature. Whereas a business plan is used to assess the viability of a business opportunity, and is more tactical in nature. A strategic plan is used to communicate the direction of the organization to the staff and stakeholders. However, a business plan is used to present the entrepreneur’s ideas to a bank. Another way to grasp the difference is by understanding the difference in ‘scale’ between a strategic plan and a business plan. Larger organizations with multiple business units and a wide variety of products frequently start their annual planning process with a corporate-driven strategic plan. It is often followed by departmental plans and marketing plans that work down from the Strategic Plan. Smaller companies and start-up companies typically use only a business plan to develop all aspects of the business on paper, obtain funding and then start the business. 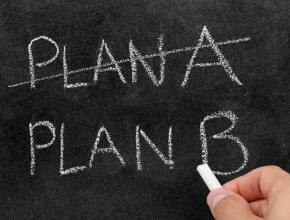 Many smaller companies – including start-ups never develop a Strategic Plan.